Palmoplantar wart is a benign skin condition caused by cutaneous human papilloma viruses. Acral lentiginous melanoma is a rare type of melanoma, which is seen most commonly in the palm and plantar aspect of sole. Post-traumatic hematoma that resolves in few weeks is one of the differential diagnostic conditions of melanoma especially when it occurs in the palm and sole. 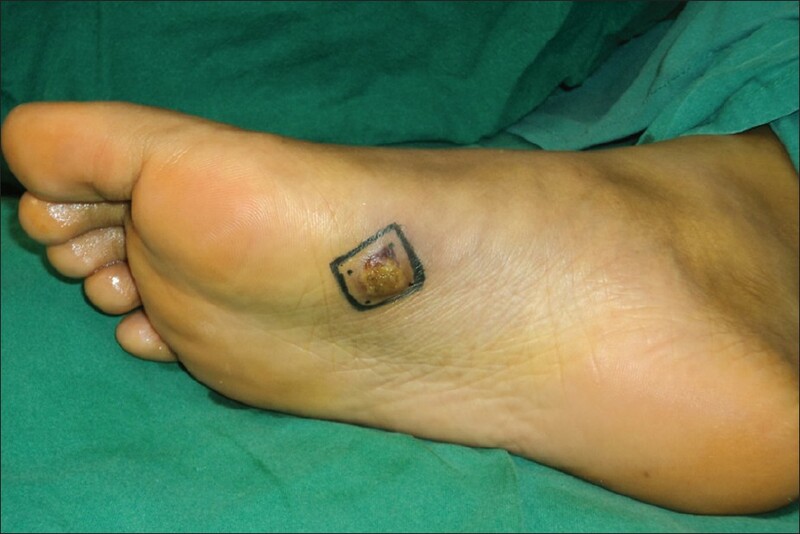 We present an unusual case where an unrecognised traumatic hematoma in a palmoplantar wart was mimicking as acral lentiginous melanoma. A 21-year-old young lady presented with a nodular lesion with glistening surface in the instep region of her right sole since last three months. Except for minimal itch, the lesion was painless and was slow growing. There was a focal area of pigmentation that was seen since last couple of weeks. On examination, there was an elliptical lesion measuring about 2 × 1.5 cm in the right instep region with focal area of pigmentation in the medial margin [Figure 1]. There were no similar lesions in the proximal part of the limb and there were no regional lymph node involvement. Retrospective enquiries revealed that she had acquired a new foot wear, which was causing repeated irritation of the involved area. This presented a diagnostic dilemma [between a non malignant skin condition and acral lentiginous melanoma] and therefore a decision was made to excise the lesion with a 2 mm margin and do a frozen section biopsy and if positive for melanoma then to get ahead with radical surgery. 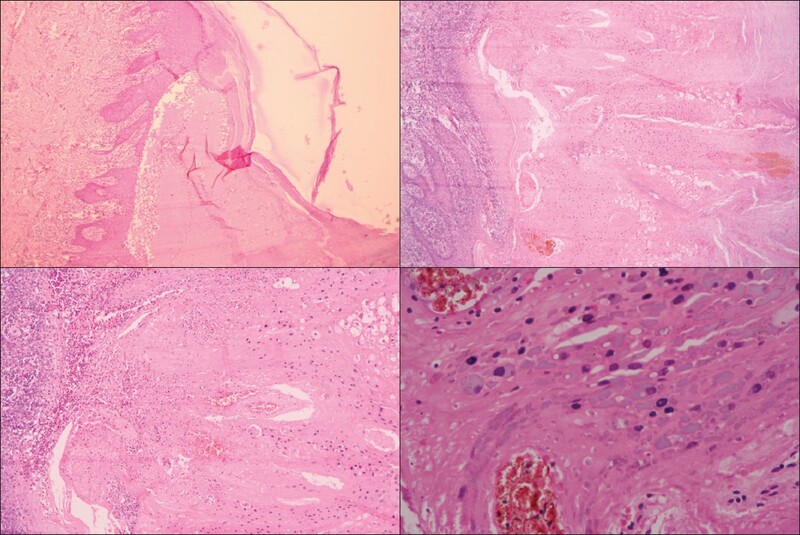 The lesion was removed surgically [Figure 2], [Figure 3], [Figure 4] and [Figure 5] and to our comfort there were no melanotic components and it was found to be a palmoplantar wart with secondary hematoma as it was noted both in frozen section biopsy and in the subsequent final biopsy [Figure 6]a-d. The post-excision defect was partly closed primarily and partly with a local flap. Acral lentiginous melanoma is a rare type of melanoma that occurs in the extremities in younger individuals. Though diagnosed clinically and later confirmed with investigations, other conditions such as seborrheic keratosis, pigmented actinic keratosis, hemangioma, venous malformation, pigmented basal cell carcinoma and traumatic hematoma can mimic melanomas. Biopsy of the lesion helps in confirming the diagnosis and management. Palmoplantar warts are benign skin conditions caused by human papilloma viruses, which are also responsible for non-melanoma skin cancers. While smaller warts can be managed by non-surgical methods, larger lesions might require surgical removal. Though the palmoplantar warts may not cause ambiguity in the diagnosis, secondary changes such as traumatic hematoma may cause diagnostic dilemma as seen in this case. We were prudent enough to completely excise the lesion with good margin and then confirm the diagnosis before covering the post-excision defect. Split skin grafts are most commonly used when the defect cannot be closed primarily. In this case, due to the laxity of skin in the instep region, the defect was covered with a local flap so as to give a good colour and contour match. 1. 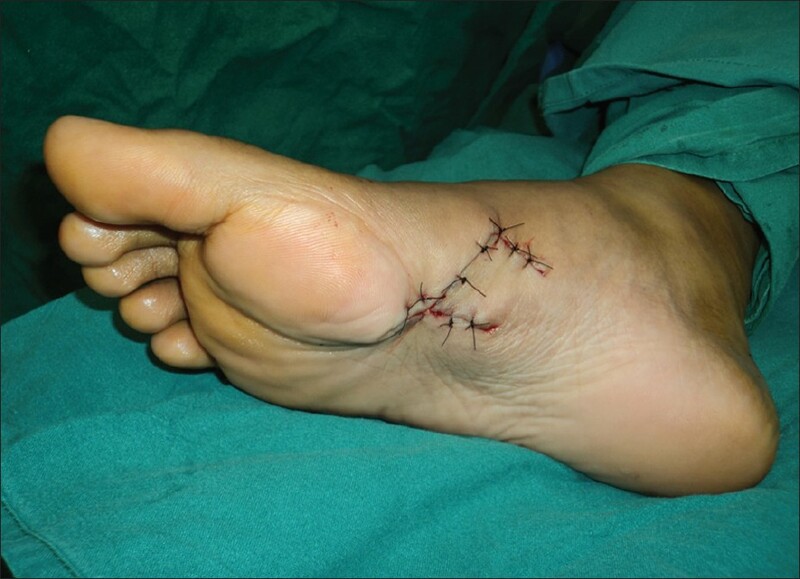 De Gorgi V, Massi D. Plantar melanoma - A false vegetant variant. N Engl J Med 2006;355:e13. 2. Hazard K, Karlsson A, Andersson K, Ekberg H, Dillner J, Forslund O. Cutaneous Human Papillomaviruses Persist on Healthy Skin. J Invest Dermatol 2007;127:116-9.